In June 2017, during the month of Ramadan, you unexpectedly attended an “Iftar” meal with some of the very sick Palestinian children and their families at Makassed Hospital in East Jerusalem. The Iftar, arranged by the Hospital in conjunction with Mr. Donald Blome, the American Consulate General in Jerusalem, was to be a message to East Jerusalem Hospitals and their vulnerable patients from Gaza and the West Bank, that nothing much has changed after President Trump has been installed at the helm, that the new US administration sympathises with their plight and will not abandon them. Being the CEO of the Hospital at the time, I remember welcoming you but politely explaining how, as Palestinian citizens of Arab East Jerusalem, we felt about the continuous aggressive attempts to “Judaise” our part of the City and how our Arab tertiary-level Hospitals in East Jerusalem, including the Lutheran-run Augusta Victoria, the Catholic-run St. Joseph and St. John’s Eye Hospitals, were barely surviving in the midst of very difficult financial and political circumstances in order to continue to serve the very sick and vulnerable Palestinian patients who crossed the heartless Israeli checkpoints in order to get life-saving medical treatment at prices they can afford. I also remember taking you on a tour to visit some medical departments. And when you went into the 30-bed Neonatal Unit and saw those little infants who weighed mostly under 1,000 grammes, you told us, with your eyes filling with tears, how that scene reminded you of the birth of your triplet children – Noah, Julia and Anna – who years ago were placed in a Neonatal Unit in a New York Hospital due to their tiny birth weight. You seemed to be full of praise of the Hospital’s work especially with the very sick children who came from Gaza and “sort of” pledged to lobby on the Hospital’s behalf. Alas…The tears we saw were those of crocodiles! For instead of your visit being a blessing for the Hospital and its patients, it turned out to be a curse! For one month after your visit, in July 2017, the Israeli forces brutally stormed Makassed Hospital including the Neonatal Unit you visited, wreaking havoc and claiming to be looking for a corpse of a young man they had shot dead outside of the Hospital gates. On that day, 21 July 2017, a massacre was avoided at the last minute when the heavily armed police, who turned the corridors of the Hospital into a battlefield, encountered families and friends of more than 100 youngsters injured while peacefully protesting at the gates of Al-Aqsa Mosque – the third holiest shrine in Islam – against the installation of electronic gates at the Mosque’s entrances, a decision later rescinded by the Israeli Government for fear of a full-blown third Intifada. Moreover, four months after your visit, I was denied entry to Israel, including East Jerusalem, although I (and both my parents and grandparents to the twentieth generation) were born and raised there. Unfortunately, Israel’s Law of Return only applies to Jews (including you of course) but not to the native Arab population of Palestine (Christians and Muslims) who made up more than 90 per cent of the population on the day Palestine was occupied by the British in December 1917. Unfortunately for us Palestinians, that is to say if you or any of your triplet children wish to live in Jerusalem although you were all born and lived in New York all your lives, you will be welcome with open arms but if I wish to return and live in my birthplace, the discriminatory laws of the State of Israel will deny me that “wish/right”. And to add insult to injury, your esteemed Government recently decided to cancel the $25 million grant that were allocated to support the treatment of very sick and poor patients in six East Jerusalem Hospitals, denying many poor children their right to life, including the pre-mature babies who brought tears to your eyes! For Makassed and the rest of East Jerusalem Hospitals, your visit was a bad omen… an empty gesture that was full of smiles and tears but you were really contemplating how to pursue your Government’s ruthless political agenda of aiming to bring the Palestinians to their knees even if you starve their pre-mature babies of intravenous injections! Mr. Greenblatt, I would like to end my open letter with a word of advice to you and your President (and also to Messrs. Kushner, Friedman, Haley, Bolton and the other entourage): No amount of starvation and misery you impose on the Palestinian people will work! On the contrary, our reaction will be like a cat “entrapped in a corner” forced to defend its vulnerable kittens. Regardless of moving the US embassy to Jerusalem or cutting aid to our Hospitals, we will resist, defy and stand steadfast in defence of our usurped rights and stolen land. Please rest assured that your aggressive policies may have brought a silent response from a few leaders but the Arab people are dead against your “Deal of the Century” and will not succumb to your futile attempts that are based on the old colonial principle of “Divide and Rule”. And standing with us will be all the peace – and justice – loving people in the world, including, in increasing numbers, many Jewish people living in the US, Israel, Europe and elsewhere, who are progressively being alienated from the American Machiavellian Mideast policies and the atrocious Israeli actions of killing unarmed civilian protesters in Gaza and the West Bank while passing a new racist Nation State Law. 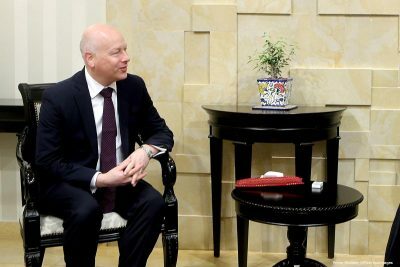 For, in the end, Mr. Greenblatt, Palestine/Israel shall be a place where each of us may practice their beliefs without trodding on the rights and beliefs of others… a secular democratic state with equal rights and equal obligations for all its citizens regardless of race, religion, colour or creed. You may dismiss this as utopian but you must agree that this is the only plausible, just and democratic solution if no one is to be thrown in the desert or the sea! Mr. Greenblatt, Please let the President know that we have existed in Palestine and Jerusalem for over 5,000 years and we do not intend to leave. The Palestinians today feel like Rocky Balboa after Round One… But it is still Round One! Dr. Rafiq Husseini is Former Coordinator of East Jerusalem Hospitals Network.